What started in 1986 as a revolutionary new design remains the world’s leading Disposable Speculum nearly three decades later. Sales of well over 10 Million kits confirm that innovation, quality, safety and efficiency are valued around the world, and never out of style. Increased awareness in the many health benefits of Professional Colon Hydro-therapy, have made it one of the fastest growing complimentary health practices in the world. If the response from the world premier of our newest innovations, the “Gel Spec Collection” is any indication, we anticipate sales to double in the very near future. We’re Famous Around the World! In 1986, Specialty Health Products, Inc. introduced a revolutionary concept in Disposable Speculums for Professional Colon Hydro-therapy. 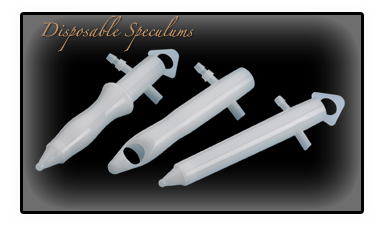 Nearly three decades later, unique styles and over ten million sold, SHP’s patented, Single Use Disposable Speculum Kits continue their world wide reputation for their quality, consistency and effectiveness. Rest assured you are providing your clients with the finest products available. Manufactured in the U.S.A., in clean, regulated facilities utilizing only the finest quality FDA cleared materials. Each Kit contains an individually packaged Speculum, a water line and a waste hose. Hoses are available in either 42 or 48 inch lengths to best fit your requirements. Each Disposable Style was created to serve specific indications. Please consult your SHP professional on how these unique designs can best meet the needs of your clients. There is nothing Standard about the “Two-Piece Speculums.” The tapered dart allows easy and comfortable insertion, the stabilized bar allow secure and comfortable set-up and extra smooth, quality finish keeps your clients safe and secure. Don’t be fooled by cheap imitation, nothing beats the quality, dependability and functionality of the SHP Disposables. Others have tried, but no one comes close to matching the quality and effectiveness of SHP’s “One-Piece Speculum.” Utilizing the easy insertion tapered tip, and lateral waste openings, our One-Piece Speculum was designed as a helpful tool for very specific client indications of impactions, chronic constipation and other colon environments. The Perfect combination of form and function. The “Tapered Two-Piece” extra smooth surface allows a gentle inserion, a secure fit and provides protection from embarrassing leakage. The Tapered Two-Piece is also the Disposable of choice for providers who utilize various reflexology and pressure point techniques during the session. For your convenience, our Single Use Disposalbe Speculum Kits are pre-packaged in increments of dozens so you may order according to your specific needs. supports not only our customers, but our local and national economy. ALL of our Disposable Speculums, water lines, waste hoses. the finest quality FDA cleared materials. health first. That’s why we have remained steadfast to quality. This patented product is the only one of it’s kind! With smooth, comfortable, safe, and secure reliability, your patients/clients will feel the difference. 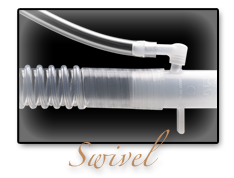 With 360˙ Swivel Water-line connection delivers safe and secure water, while making it comfortable for your patient/client. We’ve added length for a comfortable distance zone, as well as an anatomically designed taper that is conforming and prevents leaks. And that’s not all. We have specifically designed a non-irritating comfort edge with your client’s health and safety in mind. 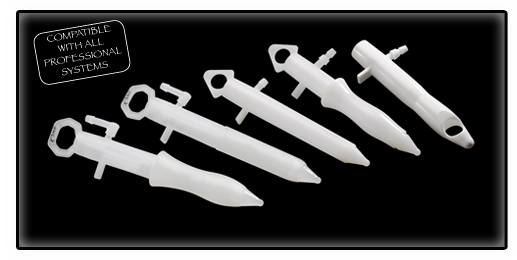 This patented product includes a new Obturator for improved stability. The Slim Line is ribbed for a non-slip grip. We have included a Stabilizer and 1/2” Indicators for a controlled secure insertion. Our soft, comfortable, and seamless Comfort Gel Layer with anatomically correct Taper is second-to-none. the New Clinical Gel Speculums in their next Colon Hydro Therapy Session.